Expert, personalized peer review and editorial advice. 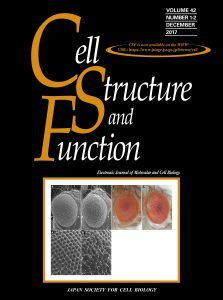 The Cell Structure and Function Editorial Board, led by Professor Hiderou Yoshida (University of Hyogo, Japan), comprises more than 120 senior academics in cell biology. Rapid peer review and online publication. The median time from submission to first decision is 21 days and the median time from acceptance to publication is 19 days. Enhanced discoverability. The large J-STAGE platform allows discoverability by all the major search engines. International reach. In addition to being seen and read by the 1200-strong membership of the Japan Society for Cell Biology, your publication will be freely available to readers worldwide. Free article alerts. RSS feeds and automatic email alerts (via J-STAGE) notify registrants as soon as your article has been published. Retain copyright. You retain copyright to your work, which is published under an internationally recognized Creative Commons license. Affordable charges. Open Access publication costs only ¥100,000 (approximately US$900) for all article types except commissioned Reviews and Mini-reviews, which are free to publish. Compliance with funding requirements. The journal’s Open Access policies support you in adhering to funding mandates. Submit a manuscript to Cell Structure and Function.